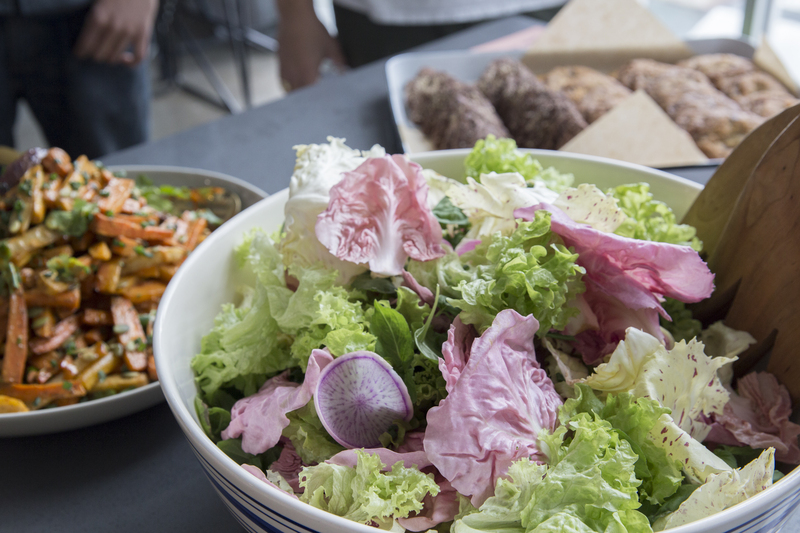 Join Pioneer Works staff, artists-in-residence, and friends in our garden for lunch. Each event spotlights a local chef or culinary organization. This month’s lunch features Woldy Kusina and Square Roots. Lunch will feature Fried Lumpia, Lumpiang Hubad, Pancit Bihon, Filipino Style BBQ, Jasmine Rice, Ube Cupcakes, and Calamansi-Ade. Woldy Kusina was founded in 2016 by Woldy Reyes and is based in Brooklyn, New York. A self-taught chef, Woldy began entertaining privately for friends while simultaneously pursuing a career in the fashion industry. His approach to food is that it should be healthy, accessible, and satisfying. While gravitating towards Mediterranean and Asian influences, his mantra is fresh, local, and seasonable. Square Roots brings together technology, entrepreneurship, and a love for local, real food to empower leaders in urban farming. Their farming campus is located in Brooklyn, New York, at the former Pfizer factory—now home to a host of NYC food businesses. Real food farmers grow local, tasty, food inside hydroponic, controlled-climate container farms located in the parking lot.